We all dream of driving fast, but we selectively forget the kind of safety implications that come with those fantasies. Jalopnik readers have picked out ten crash test videos to scare you into something with crumple zones and a handful of airbags. 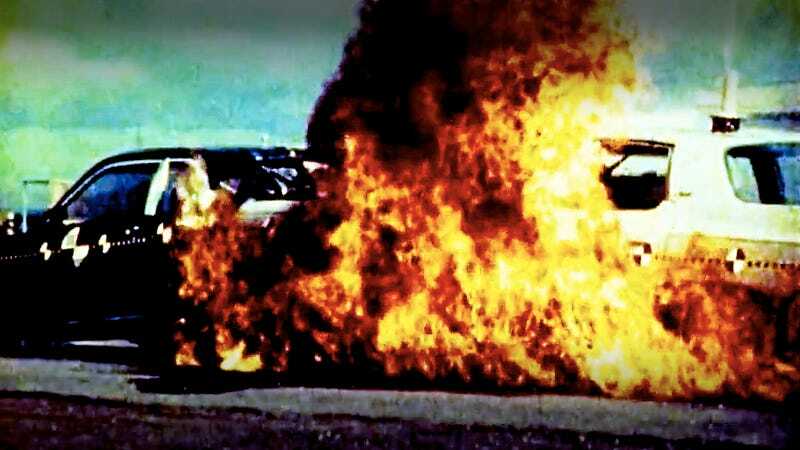 What&apos;s the scariest crash-test video? Why it's gnarly: Unlike the old beater you had as a first car, today's vehicles will get to 120 miles per hour with relatively little difficulty. If the cars we drive can reach those speeds, what would a resulting crash look like? Fifth Gear gives us the results. We're used to seeing cars crumple around the passenger cell at about 40 miles an hour, but at three times that speed, there simply no room for the crumpled humans inside. Why it's gnarly: The Insurance Institute for Highway Safety gave us a chilling look at how far we've come in passive safety when they crashed a new Chevy against the kind of Chevy the IIHS got its start testing fifty years prior.The crash begins at 1:45 in the video. The driver of that '59 Bel Air does look cool as he glides serenely to a violent death, no? Why it's gnarly: In specific, we're looking at the crash of a 2007 Brilliance BS6, one of the more sedate and production-ready looking Chinese cars. The amount of PR that Chinese car companies lost as a whole when this crash test went public was massive, and really, we're not very surprised. Why it's gnarly: General Motors was building Pontiac Transports/Montanas up to 2005. I don't want to think of how many children there are at this very moment riding on the highway in the back of a Pontiac minivan, or their identical Chevrolet counterparts. Why it's gnarly: This is a compilation of '50s and 60s cars getting hit from various angles, not unlike a crash at an intersection. There are few seatbelts, and you get the sense of why you buckle up when you see these bodies thrown violently through the cabin and outside into the wreck itself. We used to hope we would be thrown clear of a wreck, but this video gives a good argument why we don't feel that way anymore. Why it's gnarly: This is a 1992 Holden Commodore loaded with 375kg (827lb) of sand crashed at 100km/h (62mph). We tend to think of cars from the 1990s as being fairly new, but with the weight of a family and their luggage onboard, they still disintegrate like any classic old car. Why it's gnarly: Much as we think of car safety in terms of a car hitting another car, or a car hitting a wall, there are may more kinds of crashes than the ones carmakers design their cars specifically to resist. This is what happens when a truck plows into the back of a Renault Laguna and a Mitsubishi Lancer in traffic. Cut to 1:25 for the crash itself. Why it's gnarly: You know exactly what's coming, but still, seeing those flames spew out from the back of that Pinto is a chilling sight. Why it's gnarly: Ever since Jayne Mansfield got the top part of her head severed off in a 1967 crash involving her Buick Electra and a truck, the NHTSA has required trucks to have these bars on the back colloquially called "Mansfield bars." The idea is that the bulk of the car hits the bar and takes the brunt of the impact, not your decidedly non-crash-resistant skull. Well, it's time to put your trust somewhere else and take a look at this highway nightmare fuel. Why it's gnarly: In the theoretical crash taking place in this video, the drivers in the waiting queue of cars really have nothing they can do. There's just a rogue, evil truck completely beyond their control. Just as you realize the hopelessness of the cars' situation, that 2CV disappears. It just disappears. Horrifying.